TE RT. REV. F.A. BENNETT L. TH. 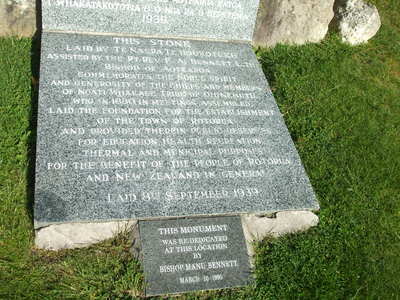 Inscription Reads : This stone is laid by Te Naera Te Houkotuku assisted by the Rt. Rev. F.A. Bennett L. Th. 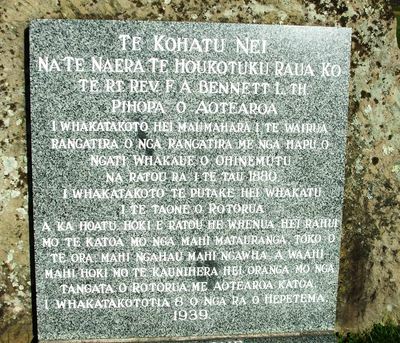 Bishop of Aotearoa, commemorates the noble spirit and generosity of the Chiefs and members of Ngati Whakaue tribe of Ohinemutu who in 1880 in meetings assembled laid the foundation for the establishment of the town of Rotorua and provided therein public reserves for education, health, recreation, thermal and municipal purposes for the benefit of the people of Rotorua and New Zealand in general.